Check out my Facebook Live on this topic! What does a Physical Therapist Treat? The Physical Therapy profession can be broken down into several clinical categories of practice including: Acute Care, Orthopedics, Neurology, Home Health, Cardiovascular and Pulmonary, Geriatrics, Oncology, Pediatrics, Sports, Schools, and Women’s Health. Within these categories of practice, physical therapists treat impairments that patients have ultimately allowing them to return to functional activities, occupations, sports, ect. Both the treatments and impairments will vary depending on the type of condition that is present. Where does a Physical Therapist work? 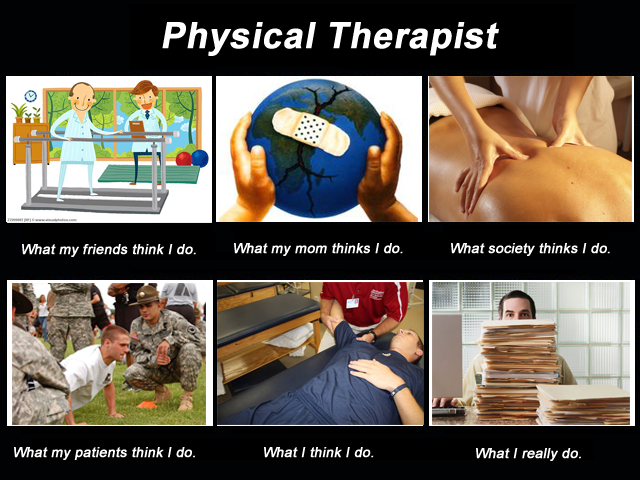 What else can Physical Therapists do? Check out my Facebook Page to view a Facebook live video addressing this topic! Get active again! Are you ready to jump start your journey of health & wellness but would like some guidance on how to make sure you achieve results? Fill out the Wellness Consultation Form (left of screen for laptops, below for mobile devices) to find out what training program is right for you. Are you having aches and pains that you would like addressed by a physical therapist? Fill out the form below to get your questions answered! Will you have the Myopic Mindset in 2018? What gap are we bridging as the Fitness Physical Therapist? Do you load your knee complex as a runner? This is one of my favorite exercises for assessing load capacity in the knee joint prior to moving on to plyometrics. It also acts as a great way to strength quads while refinining hip/knee control. What are your favorite ways to stay strong as a runner? 👇 Tag a friend who needs this exercise! 🤳Share it to help others level-up! 💪Implement and comment with feedback! Have you heard about the Strong Runner Academy? Here's what's been going down: . . ➡️Building stronger runners everyday ➡️Providing free evidence-based content ➡️Running gear giveaways Join by going to @dr.drew.dpt and clicking the link to take you there in the bio. Have you been told that you have SI joint related pain? Have you been fearful to move because of that information? This is one area in the body that I feel can often times become a scapegoat in the rehab world if there is pain in the lumbopelvic region. Interestingly enough this joint was not designed to have a significant amount of motion (milimeters) and barring some sort of traumatic collision, this joint will not be "out" of alignment. Try using the low back and hip musculature that you do have to take control of this region. By moving and building strength in your lumbo-pelvic region that carries over into running and other activities that you love! . . 👇 Tag a friend who needs this exercise! 🤳Share it to help others level-up! 💪Implement and comment with feedback! Have you heard about the Strong Runner Academy? Here's what's been going down: . . ➡️Building stronger runners everyday ➡️Providing free evidence-based content ➡️Running gear giveaways Join by going to @dr.drew.dpt and clicking the link to take you there in the bio. 5 miler with a fast finish in time to watch the @twins play in a mediocre fashion. © RehabInMotion, 2016 All Rights Reserved. Unauthorized use and/or duplication of this material without express and written permission from this site’s author and/or owner is strictly prohibited. Excerpts and links may be used, provided that full and clear credit is given to rehabinmotiondpt.com with appropriate and specific direction to the original content. Published under the Copyright Laws of The USA, by: Rehab in Motion.